Henryk Górecki, one of the leading composers of the Western-European avant-garde, passed away in his home city of Katowice on November 12th. He was 76. 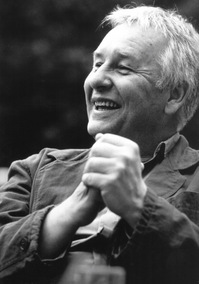 Born in 1933 in Czernica, southern Poland, Górecki worked as a teacher before studying music in Rybnik with Bolesław Szabelski. In 1961, he studied in Paris, and his music was often heard at the Warsaw Autumn festivals in the late 1950s and early 1960s. Like many of his contemporaries, Górecki's early works extended from the post-Webernian school of serialism. His orchestral work Scontri was controversial upon its premiere in Warsaw in 1960 due to its harsh articulations, and frantic, dissonant textures. In the mid sixties, with the work Refren (1965), which featured whole-tone-based harmonies, his work took a turn toward more straightforward modality and traditional expressivity. Composed for Pope John Paul II's visit to Kraków in 1979, Górecki's Beatus Vir set biblical psalm texts for baritone, chorus and orchestra, and became something of a personal victory over the secular Soviet regime. Poland's political unrest inspired many of the composer's works, including 1987's Miserere for unaccompanied chorus, composed in remembrance of the violence in Bydgoszcz between the Polish military and members of the Solidarity movement. In 1992, the Symphony of Sorrowful Songs, Górecki's Third Symphony, was recorded by the London Sinfonietta under David Zinman, with Dawn Upshaw. The recording, which TIME magazine called "a transcendental meditation on mortality and redemption," became an international bestseller, projecting the reclusive composer into the spotlight and proving it possible for a contemporary composer to achieve significant success without compromising originality or substance. Górecki's later years were plagued with poor health, and he was unable to compose much. His Fourth Symphony was scheduled to be premiered by the London Philharmonic in April, but was postponed due to the composer's health problems. The Order of the White Eagle, Poland's highest honor, which was awarded to his contemporaries Penderecki and Lutosławski in years past, was awarded to Henryk Górecki in October, a month before his death. Kronos Quartet's David Harrington said of the composer: "There is no one who can replace Henryk Górecki in the world of music. Many others have created beautiful, passionate, even exalted music. But Henryk found a way forward and beyond, through thickets of styles and fashions, that resonates of the single human being in communion with the power of the Universe. I miss him immensely." In September of 2008, the Slee Sinfonietta performed Górecki's Concerto for Harpsichord and Strings. An excerpt is available here.